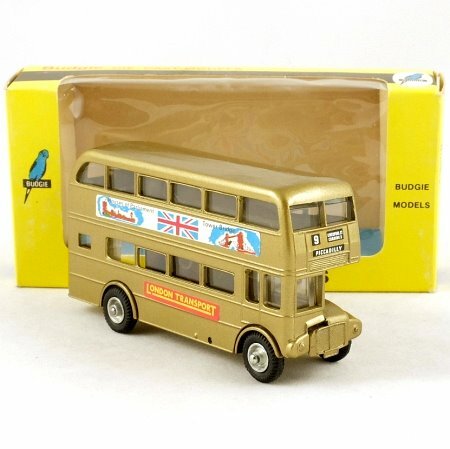 This is the gold version of the Budgie Routemaster, with clear glazed windows. Route 9 Piccadilly decals front and rear. 'London Transport' labels on the sides in yellow and red, and adverts featuring the Houses of Parliament, Tower Bridge and the Union flag. The wheels are unpainted metal with rubber tyres. In mint unused condition, and the window box is excellent.